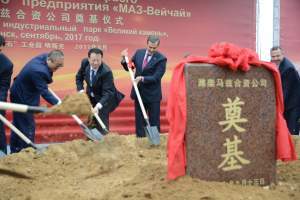 BelarusDigest > Economy > Belarus: an unwanted friend of ‘Great China’? On 16 February 2018 Belstat, the official statistical body of Belarus, announced that GDP growth for the first month of the year had reached a new high, surpassing the previous month’s record. Meanwhile, the Heritage Foundation’s statement on 5 February that the country’s economic freedoms have declined dampened the mood in the business community. 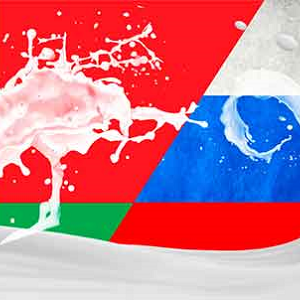 Finally, on 1 March, President of Belarus Alexander Lukashenka acknowledged the existence of problematic issues related to the supply of Belarusian milk to the Russian market. According to Belstat, in January 2018 GDP growth reached 4.6 per cent year-on-year (see Figure 1). 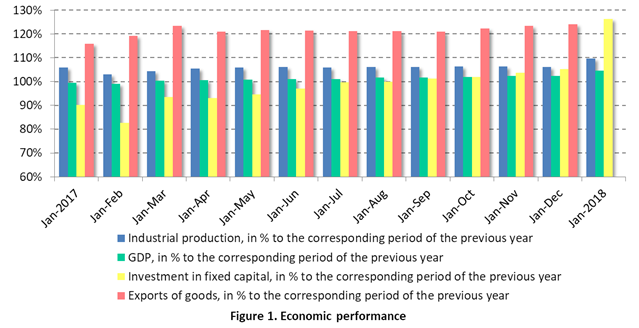 Export, investment in fixed capital and industrial production provide the foundation of this positive economic tendency. In January 2018, the growth of import of goods slowed down in sharp contrast with the strengthening growth of the export of goods. This pattern of imports mostly resulted from decreasing consumer demand which, for instance, led to declining food imports. Industrial production recovers gradually, growing by 9.7 per cent in the first month. The effect of “delayed” external demand plays a crucial role here, while the associated growth in imports of intermediate goods largely bypasses the role of domestic demand. During the preceding four years, depressed investment in the Belarusian economy showed itself most drastically in respect of fixed capital. As a result, the share of investments in GDP has fallen from its peak of about 40 per cent in 2010 to about 25 per cent today. Meanwhile, according to data announced by Belstat on 26 February, fixed investments have increased by 26 per cent year-on-year (see Figure 1). The lower level of investments in previous years has raised their quality because economic entities reject less effective projects. The growing return on capital for new investment projects in Belarus therefore probably indicates that the period of depressed investment has ended. Belarus currently supplies milk to 45 countries, but Russia remains its main market. 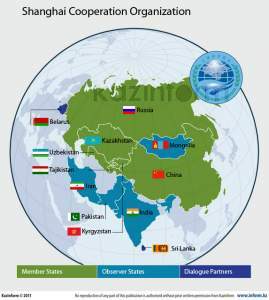 However, on 9 February Rosselkhoznadzor (the Russian State Service for Veterinary and Phytosanitary Supervision) imposed restrictions on the import of Belarusian dairy products, strengthened laboratory controls and suspended the certification of products from a number of Belarusian plants due to violations of Eurasian Economic Union norms. In 2017 Rosselkhoznadzor repeatedly limited the supply of agricultural products from Belarusian enterprises to the Russian market. For example, according to the Ministry of Agriculture and Food of Belarus, in December last year 54 Belarusian companies fell under Rosselkhoznadzor’s sanctions. 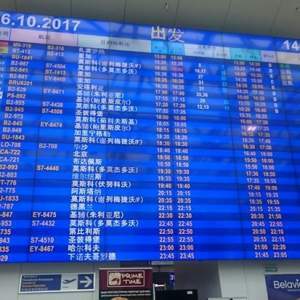 The Belarusian authorities blame the Russian side for unfair claims. According to official estimates, in 2017 Belarus lost hundreds of millions of dollars in the Russian food market due to sanctions imposed by Rosselkhoznadzor. Last year the enterprises of the Ministry of Agriculture of Belarus increased exports of products by 3.9 per cent, yet the share of exports to Russia decreased. According to Belstat, in 2017 Belarus delivered to Russia condensed and dried milk and cream for $371.4m – 12.8 per cent less than in 2016. According to experts, Russia constantly finds “harmful and dangerous substances” in Belarusian milk not because of its low quality, but due to increased production of dairy products by Russia’s own producers. The Director of the Centre for the Study of the Dairy Market of Russia, Mikhail Mishchenko, admits the lower price of Belarusian products compared to Russian. 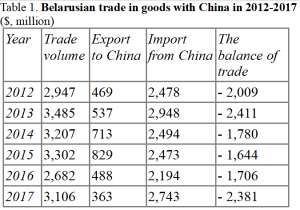 However, Russia also blames Belarus for significant volumes of re-export that pass through the country and form a significant surplus of dairy products on the Russian market. 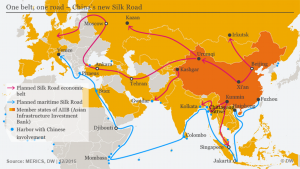 All this leads to lower prices in the consumer market of Russia, decreasing revenues of its domestic producers and results in increasing trade tensions between the economic allies. According to the latest data from the Heritage Foundation, Belarus position in the Index of Economic Freedom worsened (see Figure 2). Belarus moved from 104th to 108th place in the ranking prepared by the American research organization. The authors of the study note that, due to the stagnating economy, liberal approaches lost priority in the economic policy of the Belarusian authorities. Moreover, according to the authors of the study, the violation of private owners’ rights continues (for example, through expropriation of private property through de-privatization), as does the spread of state participation and control of the economy. The state share reaches approximately 70 per cent. These factors seriously impede economic growth, social development and lead to widespread corruption in the country. According to official statistics, the number of corruption crimes in Belarus has grown – 1,922 cases of bribery in 2017; almost twice as high as in 2016. According to the survey conducted by the IPM Research Centre in 2017, a third of respondents (representatives of small and medium-sized enterprises) admit that corruption remains a widespread phenomenon in Belarus. The Chairman of the supervisory board of the IPM Research Centre, Igor Pelipas, explains that corruption increases business costs and this, as a rule, leads to an increase in the cost of products sold and services rendered. Taken altogether, the revival of exports and end of the investment depression have given a positive impetus to the entire economy. However, Belarus still substantially lacks economic freedoms and export disagreements with Russia over food products remain unresolved.